So often we have been met with comments like this. It seems to be assumed that regular, every day people cannot sing, and that if you can, or do, or are comfortable trying, you are someone special and should be put on a stage. 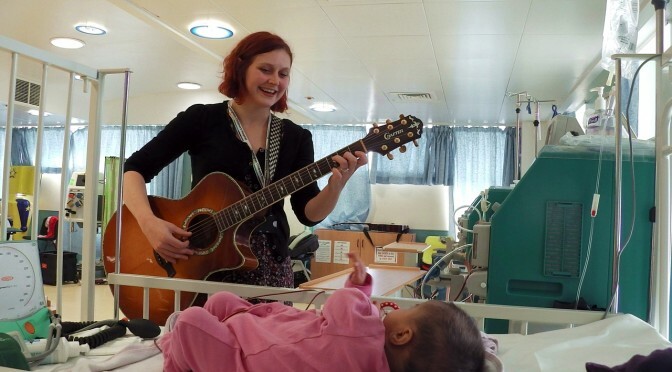 Within the last twelve months, I have been part of three events in three different healthcare settings that demonstrate the importance of singing in making deep impact connections with other human beings, where the spoken word often fails. The first of these was a young boy waiting in hospital for a procedure and needing some cream in preparation. The cream needed to be placed on his hands and elbows with bandages. This was not painful, but he appeared understandably anxious and unable to remain calm. We began singing a jolly upbeat song (Zamina) quite loudly, to meet his intensity, volume and energy. Mum was sitting with him and encouraging him, with the promise of a visit to McDonald’s later on. All of this initially calmed and engaged him, but he soon started thinking about what was going to happen to him, and started crying again. I decided to try changing the words of this song to make them about him and the special bandages he was having put on. This made him think differently about his bandages and smile a little, and altered his mood and energy. As the nurse completed the preparatory procedure, the young boy was smiling and looking at his bandages with a bit of pride and pleasure, as if the song had validated them and made it ok. The nurse stated that the music and song had really helped her finish the task. The next event was in a different hospital, one morning, with a family comprising a young male patient, Mum, Dad, and little baby boy brother visiting. As we entered the room we started playing Twinkle Twinkle Little Star. After a few moments of listening and looking, Baby started vocalising whilst looking at me. I moved closer and got down on the floor nearby. I vocalised as best as I could the same sounds back to him and maintained good constant relaxed eye contact, open mouth, and smiles. He continued vocalising with me whilst I was singing words. Then I sang in the baby’s words “ye ye, ye ye” to the tune of Twinkle. There was instant recognition and reciprocation – good confident eye contact and vocalising with me, not just at me, including some copycat exchanges, intermingled with little bits of the melody of the song. Then ensued some smiles and giggles and real joy in Mum and Baby (sitting on Mum’s knee). This is the youngest person I have ever sung with and I really feel that we made quality music together on this day. The final example of singing together came during a short session of playing music for a group of eldery people with dementia in a care home. There were at least 17 residents and 2 members of staff sitting round in a circle facing inwards, no one talking to one another. As usual, there was a lot of shouting out and getting up and wandering around prior to the music. As we started, with some gentle tunes, trying to match the volume and energy of the room, but trying not to be too loud, there was some joining in clapping, lots of smiling round the room and looking at each other. We started singing “Oh my Darling, Clementine” (a choice made by one resident’s continual quoting of the lyrics and rhythms of the song), and the room changed. There were at least 6 people singing the same words in the same time in the same song in the same room – a real sense of shared experience, working towards the same goal. Unable to see each other, talk to one another, or share most other activities, these elderly people seemed positively engaged in this activity together with smiles. Our voice is very personal to us. It is part of our identity and gives an indication as to who we are and where we are from. It is the product of vibrations made by tiny tendons being contracted and relaxed inside the voicebox, as air flows from the lungs and out through the month and nose. It is developed and formed on the way by the shape of that unique individual’s vocal tract. In order to be able to develop the voice over time, the vocal folds need to be flexed and exercised regularly in order to develop the control of the sound quality, the pitch, the breath and, with all of that, the confidence to allow your singing voice to be heard. Most importantly though, it is not about perfecting the use of the voice, but about the true benefits of taking part….. Professor Graham Welch, Chair of Music Education at the Institute of Education, University of London, has studied the developmental and medical aspects of singing for 30 years. He found that the health benefits of singing are both physical and psychological. “Singing has physical benefits because it is an aerobic activity that increases oxygenation in the blood stream and exercises major muscle groups in the upper body, even when sitting. Singing has psychological benefits because of its normally positive effect in reducing stress levels through the action of the endocrine system which is linked to our sense of emotional well-being. Psychological benefits are also evident when people sing together as well as alone because of the increased sense of community, belonging and shared endeavour.” www.heartresearch.org.uk. I believe it is important to keep facilitating opportunities for people to use their singing voice more and learn to feel comfortable with this, developing their skills through experiencing the benefits of song, especially in healthcare settings. Just because you are not Adele or Robbie, why would you deny yourself these life-changing moments? To baby, Mum and Dad’s voice is the best in the world.